A satisfying and refreshing recipe that perfectly accompanies the start of California pear season! At last California pear season has arrived! Most years you can expect to celebrate the start of pear season with a bang (fireworks that is) because the first pears in the USA are typically harvested around July 4. A late cold snap this Spring pushed back harvest a couple weeks, but the wait is over. Blushed Bartlett pears are being plucked from trees along the sunny Sacramento River Delta by the truck load. 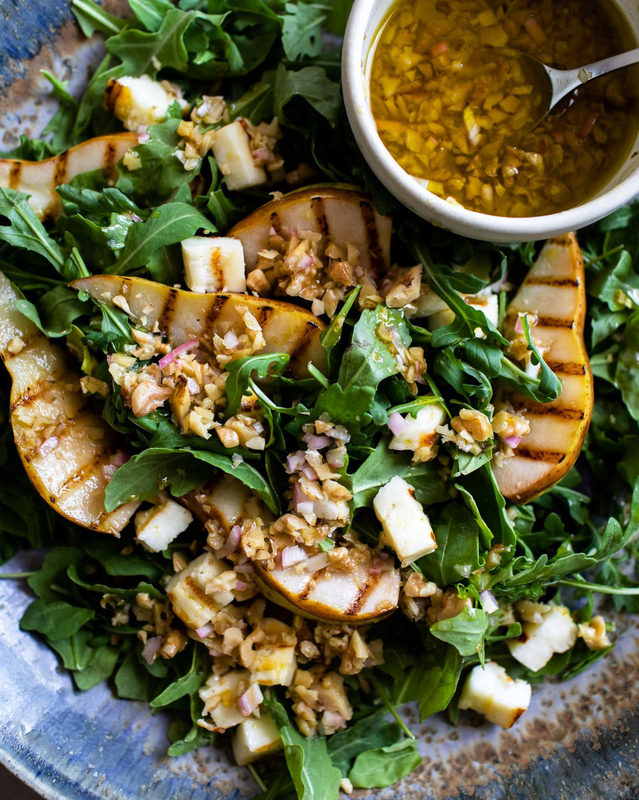 We are kicking off pear season with this refreshing Grilled Pear Halloumi Salad recipe from Erin Alderson of Naturally Ella. Erin also shares a few of her favorite ways to enjoy the juicy goodness of California pears. Image courtesy of Erin A.